Against strong title contender Vasco da Gama, Palmeiras did what any true palmeirense would expect from the team: went out and did their best, honouring the jersey and the club’s history. The draw was a fair but not great result, as it didn’t completely (i.e. mathematically) save Palmeiras from relegation but instead allowed Corinthians to open up a two points advantage in the run for the championship title. While Vasco confront Avaí, Fluminense and Flamengo in the last three rounds, Corinthians take on Atlético/MG, Figueirense and Palmeiras. On paper Corinthians have the easier path, but in this Championship one can expect anything to happen. 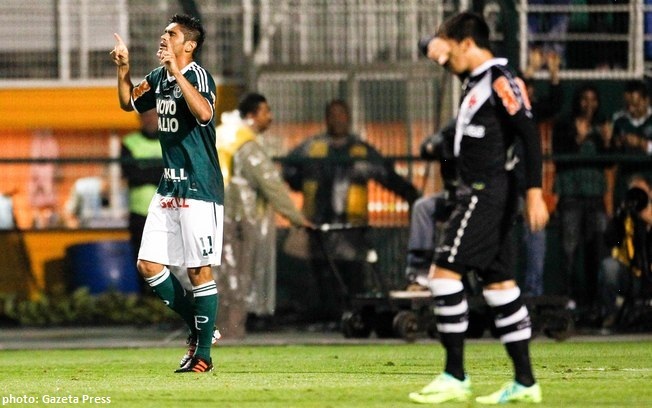 While Palmeiras are not mathematically safe, the danger is now minimal. At 12th position in the tables, and even if losing the last three remaining games, only an extremely unlikely combination of results would bring about disaster. Yesterday’s game against Vasco was surprisingly even, with Palmeiras showing a lot of spirit and heart but not much else. After suffering an early goal, the turning point for the Verdão came when Scolari substituted Patrick and Ricardo Bueno for Pedro Carmona and Dinei. The two, and in particular Pedro Carmona, came on hungry and chances started to materialise. Assunção, as always dangerous, took the corner that led to the equaliser by Luan. Again, Palmeiras are showing certain progress; looks like we hit bottom and are slowly finding our way back to the surface. Pre-game there was a certain amount of speculation regarding what attitude to expect from Palmeiras, considering archrivals Corinthians’ interest in the outcome. 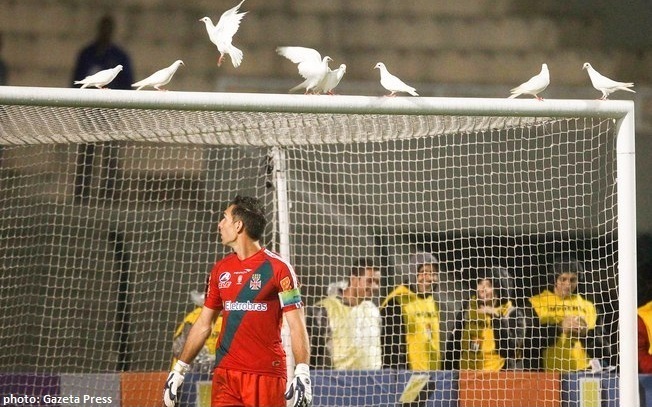 Could the white pigeons look forward to a peacefully rest on Vasco goalkeeper Fernando Prass’ crossbar all night? The highlights below will give you the full story: it was full throttle from start to finish. This coming Sunday, Palmeiras travel to Salvador to face Bahia. Three points would surely boost morale and scare São Paulo and Corinthians shitless; can you imagine Palmeiras in the last two rounds depriving the former of a spot in next year’s Libertadores Cup and the latter of the title? I imagine it when I’m awake and dream about it at night. Yep, it was a good game, but not exactly the one I was expecting to watch on TV. I knew the “battle” wouldn’t be easy, so I found some reinforcement by suggesting my parent’s place as a “neutral ground”. Of course, my daddy is a Vascaíno and the origine of my love for the team! Surprisingly, when Cristovão Borges and Luiz Felipe Scolari hugged each other before the match, I felt the game could end in a draw, although I insisted in my 1X0 score for Vasco. The result wasn’t good for both teams; but it wasn’t too bad either. At least, peace reigns at home again: Kris is ready to support me against the others and I’m ready to support him against his enemies. This is what I call a perfect combination of love and luck. What can I say that hasn’t been said already? Ah…. That’s my girl, that’s the spirit!